At Perfect Labels, we’re a bit like that well-known varnish advert, “doing exactly what it says on the tin”. We make the perfect labels for all sorts of items. In fact, one of our core products are labels for clothing. We’re not talking about the kind of labels you’d sew into a school uniform – our woven clothing labels are the kind used by clothing retailers across the world, sewn into the garment to show the retailer or designer’s name and some basic information about the item. If you’re in the commercial clothing or textile industry, we’re pretty sure that we’re exactly what you’re looking for. 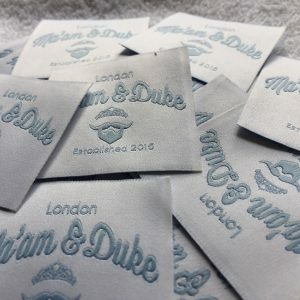 Perfect Labels’ high-quality woven labels really will be the perfect finishing touch for your apparel, reflecting the superb quality of your brand’s style and designs. But what can they tell your buyer? These days, the savvy consumer wants to know more about what they’ve purchased, and a customised woven label is the best way to inform them. For example, while we don’t yet have the regulation in the EU, clothing in the USA and New Zealand must show where the garment was manufactured. And why not? If you’ve gone to the expense of having your item made in a prestige location, you should show this on your label. Consumers like accountability. Surely it’s only a matter of time before Europe follows this excellent labelling trend. A custom label also allows you be a little more creative with your design. This is particularly useful if your garments are handmade, unique or unusual. Switch in some emoji symbols, or use a particular handwriting-style font to tell your customer about the item. It will certainly add to the authenticity of your product. You can get ahead of the game by thinking creatively, and we can help you stay ahead of the pack by bringing your one-of-a-kind labels to life. As a designer, you know that your only limit is your imagination, and that’s a vision we share with you. 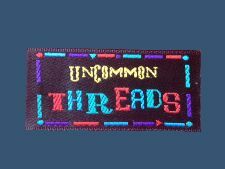 We also produce custom-made jacquard woven ribbons for designer clothing. Please browse our website to learn more about how we can help to make your designer clothing more special. Contact us today, our contact details are here. We have a wide range of branding labels for clothing. All our woven labels are customized to your design specification.